Get your own secure payment pages to easily process online payments. Customize your payment page and link to it from emails, event registrations, and your website to give members a seamless payment experience. 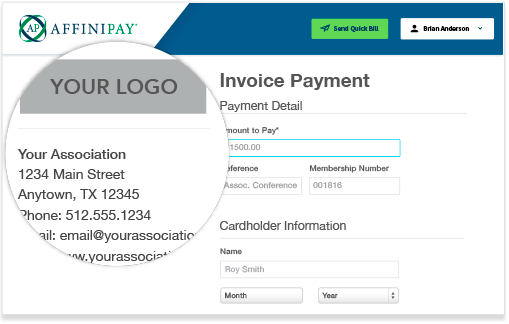 You can personalize your payment page with your association’s information and logo to make the payment process familiar and professional. Your payment page can be used in person or securely shared with members so they can pay from a computer or mobile device, on their own time. All payment pages are hosted on AffiniPay’s secure, PCI Level 1 compliant servers, which means data stays safe and private. Give your members a seamless payment experience so that they can pay for member dues, donations, and more without ever leaving your website. Your payment page is one of the most versatile ways for you to accept credit card payments. Key in or swipe payments in person, or share your payment page with members to let them pay on their time, at their convenience. Include your payment link on any specific invoices you create so that your members can quickly and securely pay for membership dues, events, sponsorships, and more. Add your payment link to email communications so members can easily and securely submit payments with just a few clicks. Integrate online payments with your website by adding a payment link to your header or footer, so your visitors immediately know how to pay you.